As someone who has a lot going on, is often (unfortunately) absent-minded, and has 1000 ideas at a time rolling around in my head, productivity is something I need to actively focus on and keep myself accountable to in order to get anything done. I’m useless without a to-do list, and that’s okay. Productivity takes practice. For me, it’s all about systems; specifically systems of to-do lists. It doesn’t matter where your system is, or how you maintain it, but as long as the system works for your schedule and is maintained in a medium you will look over and return to, it’s a solid choice. 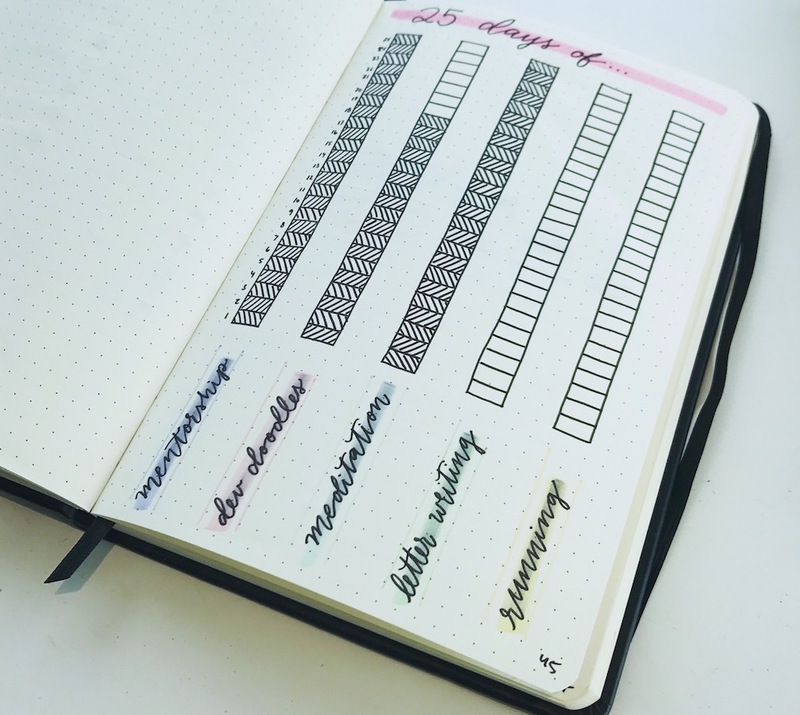 I’ve had two different types of goal/to-do lists (one digital, and more recently, a physical one), so it just depends on where you want to track your progress. I’ve found them both to be solid approaches. I've been keeping lists since high school. Here's one from a sememter at university — the only way I'm able to get everything done. My open sourced personal goals system lived where I lived: in my browser. And I extended this to by in my terminal too. Soon after beginning the system, I created as series of terminal aliases which helped me review my to-do list, check off items do week-in-review, and more, all in the terminal itself. I made this system a habit of mine that I maintained for about 3 years. I realized that the closer I followed this system (the more I checked in and the more on-top of my reviews I was) the more productive I was. Hands down. But I also saw myself moving away from this system, checking in a little bit less, and writing reviews days late as my life shifted a bit. So I wanted to revamp my organizational system and take it offline just to try something new. 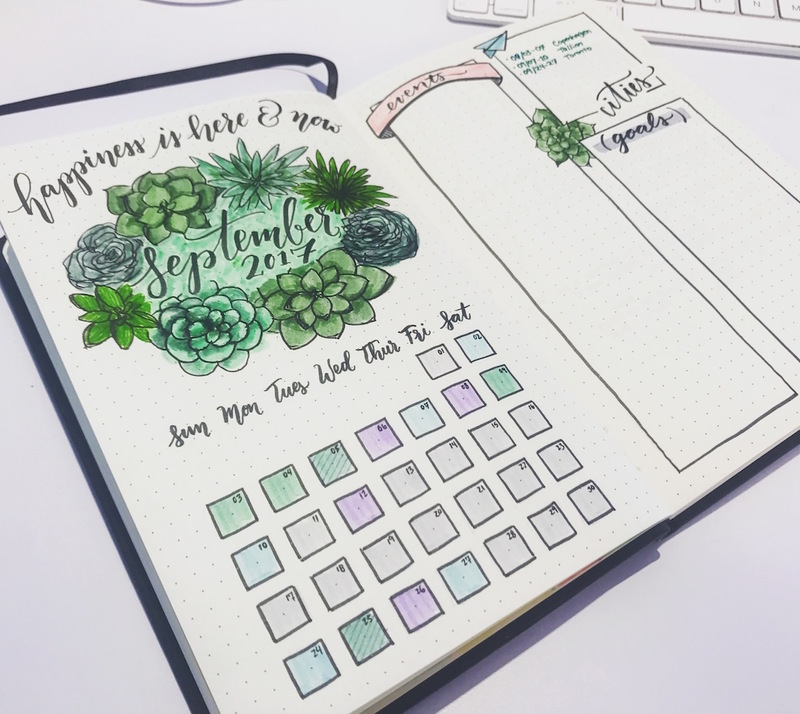 Bullet journaling references a specific style of note-taking created by Ryder Caroll. There’s a whole system invented by him that you can learn about here. My adopted system takes some cues from the original bullet journaling system, but is updated to my preferences. For example, instead of bullets, I use circles and boxes. I use circles to represent events and boxes to represent tasks. When I accomplish something, I fill in the entire box. When it’s partially complete, I fill in half of the box. I still do goal check-ins (I think this is really important) and I’ve also maintained week-long “sprints” of TODO lists, which I have found work best for me. Doing a check-in of my yearly goals. So I want to go through one of those spreads with you: the one I find most useful — the weekly spread. 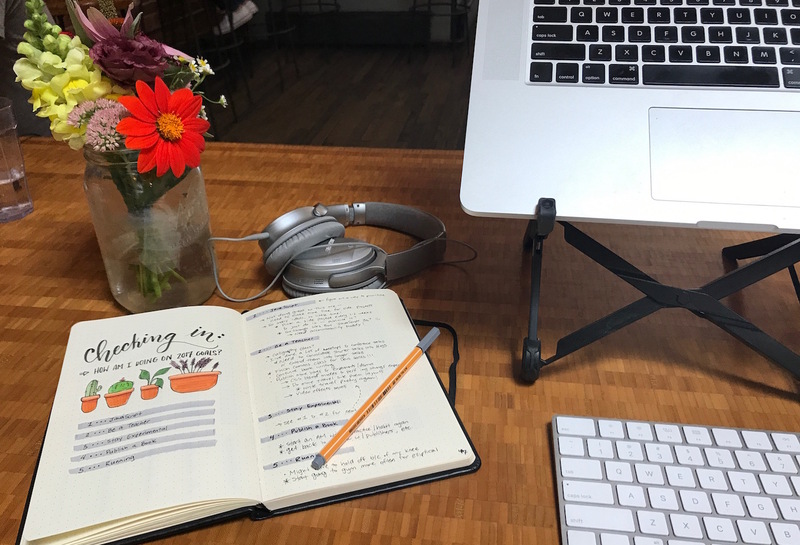 I use separate journals for work and for my personal/outside-of-my-day-job projects, and spend time on them (it’s worth it and also relaxing) every Sunday night (for my personal to-dos) and an hour Monday mornings for my work to-do list. Spending time figuring out what you need to accomplish is not time wasted! It’s critical time spent that will reduce wasting time in the future. Then, I go through and write up next week’s list :). It’s important to have a set date/time to review and update your system periodically (I use Sunday nights or Monday mornings for this). Consistency is really key here to make this something that actually makes you more productive. If you write a list once and never refer to it, then it’s not very useful! 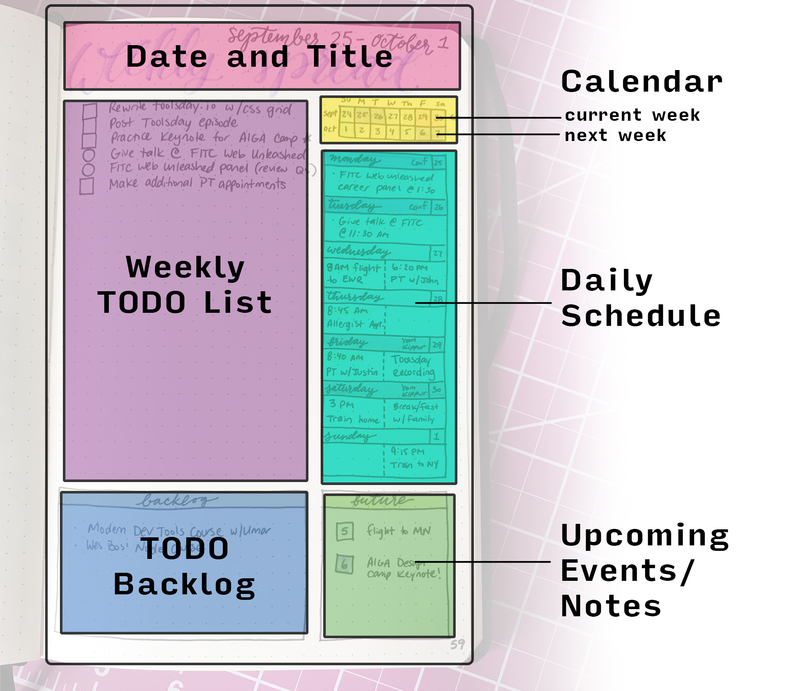 TLDR: Play with different types of TODO list systems. See what works for you, and stick with it! I hope you enjoyed this post. Let me know what you do for productivity below!